On June 17th from noon to 7 pm, Bee Cool Snowballs will celebrate the grand opening of Houma’s newest dessert establishment. 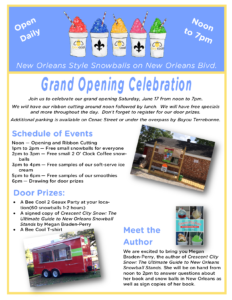 The Babin family first opened Bee Cool in its portable snowball stand, Bee Cool 2 Geaux, on May 3. Now they want to introduce you to their full line of Southern treats.